The community engagement project in the Den Burn Valley, Aberdeen, explores how creative approaches could be used by Scotland’s flooding authorities to engage with communities vulnerable to future flooding. Taking place over seven months, project partners are trialling this approach in the west end of Aberdeen where the Council have undertaken a number of actions to manage surface water flooding and the flooding of a local Burn. 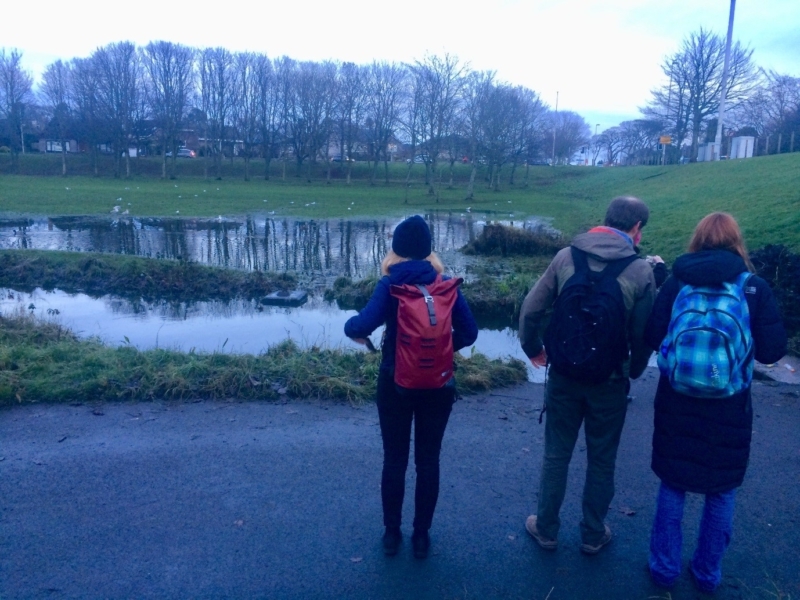 By engaging community groups through an approach involving walking, listening, song writing and singing, the project aims to raise levels of flood awareness and preparedness in a way that is meaningful and relevant to the community. We are working with local musician and public engagement officer, Simon Gall, who has 15 years’ experience writing, recording and touring with musicians and world music bands based in Scotland as well as teaching and developing music projects with hard-to-reach groups. Over the winter 2019, Simon will design and run creative workshops with community groups in the Den Burn Valley (Summerhill and Mastrick) including Fernielea Primary School’s P6 class. Students will take part in a nature walk along the Burn recording sounds they hear and learning more about some of the flooding issues as well as learning and performing a song on the Den Burn and a ‘being flood prepared’ memory song. We aim to follow a similar approach with an adult group in the area, holding planning meetings with the group in advance of the workshop to tailor the session to their needs and interests. Applying his skills and experience in creative learning, Simon will focus both on the process and outputs of the workshops. The process of the creation of the soundscape and the songs/game will be a fun and creative experience which will help the participants consolidate their learning. The outputs i.e. the songs/game, will hopefully live on in the school and community folklore being taught at assemblies and outings. If it works and enters oral tradition, it will be a valuable way of carrying forward important messages and understanding about flooding in the local area. The outputs (two songs and the soundscape) will be performed live to parents of Fernielea Primary students. This harnesses music’s other great power of bringing people together into a space. At the school performance, parents and guardians will have the opportunity to learn with their children and engage with the topic through informal conversation with the project team. Why use a creative approach? People generally open up when taking part in positive creative activity and are often more at ease in sessions when they’re being run by a musician, for example. This supports the opportunity for new learning about the subject matter. In the case of flooding, it can be quite an emotive subject and difficult to imagine the impact. Using the arts to engage can allow for individuals to realise the risk without having to actually experience it or provide a way of processing emotions for those who have directly experienced flooding. We are working with researchers at Robert Gordon University and University of St Andrews to understand the potential benefits of this arts-based approach and will hold an evaluation meeting following workshops to reflect on the process and outcomes of the project. The creative activity and outputs from workshops will be documented by a local filmmaker and shared through partners’ websites and social media channels, along with a reflective report. The project, a partnership between SEPA and Creative Carbon Scotland support from Aberdeen City Council, has been commissioned by SEPA with via SEPA’s Research and Development Fund. SEPA is Scotland’s national flood forecasting and warning and strategic flood risk authority. Aberdeen City Council works with SEPA to minimise flooding and is responsible for implementing and maintaining flood protection actions.